The Nintendo 64 may be out of date, but it is one of my favorite video game consoles. 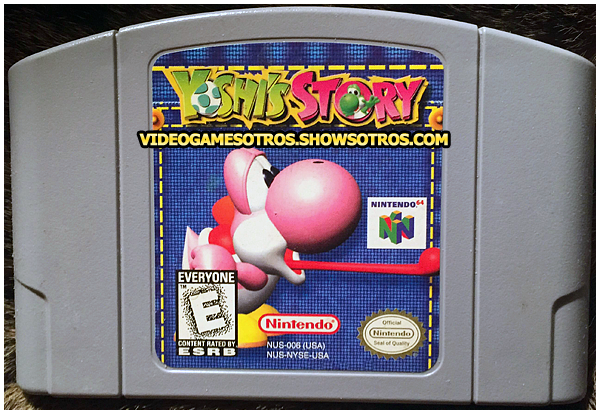 One of my favorite games of all time is Yoshi's Story, which was released in Japan in 1997 and then worldwide in 1998. It was re-released on the Wii's Virtual Console in 2007, and later for the Wii U's Virtual Console in 2016.
should all talk about this!" Yoshis happy, certainly the world would return to normal. reclaim the Super Happy Tree! The game has the player choose between Story mode or Trial mode where they choose what course they want to try. Trial Mode shows the courses you have beaten so you can work on your scoring and practice, while Story Mode contains the substance of the game to defeat Baby Bowser. Being numbered from 1 to 4, the courses are sorted by difficulty, and the choice of which course to play is made individually for each page. However, while the first page will always display four courses, the following pages will initially be limited to only one course until you unlock more courses when you collect the special hearts. Each course has three collectible hearts, and the number of hearts collected will determine the number of additional courses that will be unlocked on the following page. For example, if the player collects two hearts during a course, they will be allowed to choose from course 1, 2, and 3 on the next page. The music itself is iconic, the jumping fluttering noises and the long tongue grabbing the magic fruits has always brought a smile to my face. The multi-colored Yoshis are fabulous, and you even get bonus ball and white Yoshis! Collecting the type of fruit that suits the color of your Yoshi gets you extra points, licking power flowers and eating shy guys to shoot Yoshi eggs at other bad guys is always a blast! This is one of those games that brought me great joy since I was 12, and continues to do so. I just wish it was brought back to light, despite the mixed reviews by critics. I highly recommend checking it out!